When the predecessor of international fast food restaurant chain Burger King (BK) first opened in 1953, its menu predominantly consisted of hamburgers, French fries, soft drinks, milkshakes, and desserts. After being acquired by its Miami, Florida franchisees and renamed in 1954, BK began expanding its menu by adding the Whopper. The company did not add another permanent hamburger to its menu until the introduction of the Big King sandwich in 1996 in response to McDonald's Big Mac sandwich. The company began experimenting with premium hamburgers, made from higher quality ingredients, in 1978 with the introduction of its Specialty Sandwich product line. The products were some of the first designed by a fast food restaurant chain that were intended to capture the adult market, members of which would be willing to spend more on a higher-quality product. However, it wasn't until 2002 when the company began to work on a premium burger in earnest. On the value side, Burger King first started offering sliders to its menu in the mid-1980s and offered them off and on for the next twenty years. The company's first major chicken product, its Original Chicken Sandwich, was also part of the company's 1978 Specialty Sandwich line. BK Chicken Tenders made their debut in a menu revision and expansion in 1985 to address the absence of a chicken fingers product akin to McDonald's Chicken McNuggets. The company began offering the first, nationally available grilled chicken sandwich product when it added the BK Broiler in the early 1990s. That sandwich would go on to be reformulated and renamed several times before settling on the current TenderGrill sandwich. The chain added a second chicken finger product with the introduction of its BK Chicken Fries product in the mid-2000s. BK Chicken fries would also be removed and re-added to its menu in response to ownership changes and customer demand. The company introduced the first iteration of its breakfast menu was another addition that came in with the company's in a 1978 menu expansion. Initially a clone of McDonald's breakfast line, the company began to differentiate itself with the introduction of the Crosan'wich breakfast sandwich in 1982. The Whopper sandwich is the signature hamburger product sold by the international fast-food restaurant chain Burger King and its Australian franchise Hungry Jack's. Introduced in 1957, it has undergone several reformulations including re-sizing and bread changes. The burger is one of the best known products in the fast food industry; it is so well known that Burger King bills itself as the Home of the Whopper in its advertising and signage. Additionally, the company uses the name in its high-end concept, the BK Whopper Bar. Due to its place in the marketplace, the Whopper has prompted Burger King's competitors, mainly McDonald's with at least six different products and Wendy's with its Big Classic, to try to develop similar products designed to compete with it. The company markets several variants of the burger, such as the Whopper Jr., as well as other variants that are specifically tailored to meet local taste preferences or customs of the various regions and countries in which it does business, such as the teriyaki Whopper in Japan or the LTO Canadian Whopper. With the company's expansion into India, the chain introduced two new variants on the Whopper while reintroducing the chicken version of the sandwich. To accommodate practitioners of Islam and Hinduism, who make up the majority of the Indian population, the chain has eliminated beef and pork from its menu. In their place, the chain is using a combination of chicken, vegetarian patties and mutton in place of beef. To promote continuing interest in the product, Burger King occasionally releases limited-time offerings ("LTO") on the Whopper such as the Windows 7 Whopper in Japan as a product tie-in with Microsoft's Windows 7 operating system. The hamburger contained seven stacked beef patties and measured 5 in (13 cm) high, weighed almost 2.2 lb (1.00 kg), and had more than 1,000 kcal (4,200 kJ). It was originally planned to be available for only seven days starting on 22 October 2009. Due to its success in selling 6,000 sandwiches within the first four days, Burger King decided to extend the promotion period an extra nine days, ending on 6 November. The Big King sandwich is one of the major hamburger products sold by the international fast-food restaurant chain Burger King, and has been part of its menu for more than twenty years. During its testing phase in 1996–1997, it was originally called the Double Supreme and was configured similarly to the McDonald's Big Mac—including a three piece roll. It was later reformulated as a more standard double burger during the latter part of product testing in 1997. 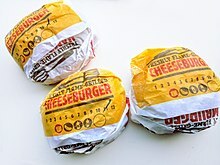 It was given its current name when the product was formally introduced in September 1997, but maintained the more conventional double cheeseburger format. Its introduction capped a period of sales success for Burger King, where the company successfully took on its rival McDonald's. The product was renamed King Supreme in 2001 when it was slightly reformulated as part of a menu restructuring during a period of corporate decline for the company in which its corporate parent, Diageo, was trying to sell the company. When a TPG Capital-led team of investors took over the company in 2002, the new management team again restructured the menu, eliminating the King Supreme in favor of its new BK Stacker line of sandwiches. The sandwiches were part of a line of controversial sandwiches high in fat and calories which several groups protested. A limited time offering (LTO) sandwich line known as BK Toppers accompanied the Stacker line briefly in 2012, including one sandwich known as the Deluxe topper — a virtual clone of the Big King in its formulation. The Stacker and Topper lines were discontinued in the United States shortly after, and the Big King returned to said market in November 2013 as a permanent product after the company was again sold, this time to 3G Capital of Brazil. As far back as the 1970s, international fast food restaurant chain Burger King has attempted to introduce a premium line of burgers. These sandwiches are part of a system which eventually became known as the barbell strategy; a plan designed to expand Burger King's menu with both more sophisticated, adult-oriented fare along with products that are more value-oriented. This program is intended to bring in a larger, more affluent adult audience who will be willing to spend more on the better quality products on one side while maintaining a lower cost value menu dedicated to a more cost-conscious audience on the other. The hope is that the customers would be drawn in initially for the lower prices of the value-menu and upgrade to the more expensive products, upping overall sales. The chain's first major attempt was part of their Specialty Sandwich line that was introduced in 1979 was the Sirloin Steak Sandwich. After the failure of the Specialty Sandwich line, Burger King went on to introduce several other premium burgers made from a variety of meats. One major example introduced in 2002 was the BK Back Porch Griller sandwich line. The sandwich, introduced in May 2002 was a pronounced failure, and pulled in September of that year. The next product Burger King introduced was its Angus Steakburger which it began selling in 2004; it too had lack-luster sales due in part to the patty being par cooked. The sandwich was later reformulated as the Steakhouse Burger which used a thinner, flatter, fresh cooked patty. The Steakhouse Burger sandwich was eventually replaced with the Steakhouse XT/Angus XT burger, which used a new, thicker round patty among several other changes. This newer sandwich was made possible with the introduction of the company's new broiler systems which allowed varying cooking times and temperatures which in turn gave the company the ability to utilize fresh cooked, thicker patties in its sandwiches. Only variations of the sandwich that explicitly state "Angus" in the title are manufactured from meat from Angus cattle. In 2011, the company discontinued selling the product in the North American market, replacing it with the Chef's Choice burger. The Chef's Choice Burger was removed in 2012. 2014 saw the introduction of the newest attempt at introducing a premium burger to the company's portfolio with the introduction of the A.1. Ultimate Cheeseburger in North America. Internationally, the chain has introduced several lines of premium sandwiches. In New Zealand, the chain first introduced the BK Crown Jewels line which was based upon the Whopper, TenderGrill, and TenderCrisp sandwiches. The line was eventually replaced with the BK King's Collection menu of Angus-based sandwiches. It also sold Angus-burgers in Australia, Great Britain and Ireland. In East Asia, the chains sells the Angus XT sandwich which is a variant of the Steakhouse XT. In Great Britain, the chain has also introduced a burger based on lamb and another based on Wagyu beef, while back in the United States it sold a turkey burger sandwich – all of which were limited time offerings (LTOs). International fast-food restaurant chain Burger King has sold a variety of sliders, or mini-sandwiches, since the 1980s. Burger Bundles was the first iteration, a set of three small hamburgers or cheeseburgers. These sandwiches were eventually replaced with a reformulated product called Burger Buddies that was sold in pairs. After a change in management in 2004, Burger Buddies were re-released as BK Burger Shots. The company has also sold several chicken and breakfast sandwich versions of these products. The BK Stacker sandwiches were a family of hamburgers featuring the same toppings that targets the late-teen–to–young-adult and male-oriented demographic groups. It is a cheeseburger consisting of anywhere from one to four 1.7 oz (48 g) grilled beef patties, American cheese, bacon and Stacker sauce served on a sesame seed bun. The BK Stacker was first introduced in the summer of 2006. The chain garnered media attention due to the size of the sandwiches, particularly the Quad, and the large amount of calories and fat that the sandwich had (see the Enormous Omelet Sandwich breakfast sandwich.) In a November 2006 menu revision, the Double BK Stacker became a numbered Value meal item in North America, with the number varying by market area. The Stacker line was updated in 2011. The stacker line was moved to the value menu with a reformulated ingredient list by deleting the top layer of cheese. The changed pricing structure created a situation where the distribution of ingredients doesn't scale at the same rate as increasing numbers of burger patties. Two single Stackers at one dollar included more cheese and more bacon than one double Stacker for two dollars. Three single Stackers had 50% more cheese and double the bacon of one triple Stacker. The BK Stackers are a family of hamburgers, consisting of one to four 1.7 oz (48 g) hamburger patties, bacon, American cheese and the King Sauce used on the Big King served on a sesame-seed bun. The BK Stacker was introduced using commercials that employed groups of little people in the roles of members of the "Stackers Union". The characters were "Vin," played by Danny Woodburn, "the new guy," and various members of the "Stackers Union" construction team that work in a BK kitchen assembling the sandwiches. The tag line was "Meat, Cheese and Bacon- Stacked High". As exemplified in the advertising campaign, part of the sandwich's concept revolves around not having vegetables like lettuce, onions, or tomatoes. The BK Toppers line was a line of cheeseburgers introduced in October 2011 as limited time offer. The sandwiches featured a new 3.2 oz (91 g) chopped beef patty that features a coarser grind than the company's 2 oz (57 g) hamburger patty. The four sandwiches in the line were the Cheeseburger Deluxe, Mushroom and Swiss, Bacon and Cheddar, and Western BBQ. The sandwiches were a part of the new ownership's plans to expand its customer base beyond the 18- to 34-year-old demographic which it had been targeting over the previous several years. The product resurrected a previous name from the BK Hot Toppers line of sandwiches from the 1980s. They were removed from the menu in July 2012. The company used its advertising firm of McGarryBowen and a food-centric campaign to introduce the products. The ads feature the tag line of More beef, more value, with the television commercials utilizing images of the ingredients of the sandwiches as they are being prepared. The Rodeo sandwiches are a line of similarly topped sandwiches targeting the value conscious demographic. They are topped with three onion rings and barbecue sauce served on a small sesame-seed bun, and can be made as a hamburger, cheeseburger or chicken sandwich. The Rodeo Cheeseburger was created to coincide with the release of the film Small Soldiers in 1998. It originally was available as just a cheeseburger topped with Bull's Eye brand barbecue sauce and onion rings. The Rodeo Cheeseburger was nationally discontinued in the U.S., but it was regionally available in some locations as part of Burger King's value menu. In 2007, BK switched its barbecue sauce from Bulls-Eye to Sweet Baby Ray's Barbecue sauce. In 2013, the Rodeo Burger was reintroduced in the U.S. as a new line of value sandwiches with a US$1.00 price. The new base level sandwich removed the cheese from the burger and introduced chicken version of the sandwich. The cheeseburger version was still available, but with an additional cost of up to 50¢. The Rodeo burger is a hamburger, consisting of a 1.7 oz (48 g) beef patty, barbecue sauce and onion rings on a sesame-seed bun. A cheeseburger variant adds a slice of American cheese, while the chicken variant swaps the beef patty out with a 2 oz (57 g) fried chicken patty and extra serving of barbecue sauce. The Rodeo cheeseburger was advertised using a parody of the Tom Cruise/Jack Nicholson film A Few Good Men. In the commercial, Chip Hazard quoted Jack Nicholson's line "you can't handle the truth" as "you can't handle the Rodeo Burger." The Original Chicken Sandwich, the primary product in the Specialty Sandwich line. The Burger King Specialty Sandwiches are a line of sandwiches developed by the international fast-food restaurant chain Burger King in 1978 and introduced in 1979 as part of a new product line designed to expand Burger King's menu with more sophisticated, adult oriented fare beyond hamburgers. Additionally, the new line was intended to differentiate the company from other fast food hamburger restaurants at the time. Since the line's introduction, the other sandwiches have been discontinued, leaving the chicken offering, the Original Chicken Sandwich (abbreviated as OCS), as the primary product left. Additionally, other sandwiches that utilize the same roll as the chicken sandwich have been introduced to the company's menu both domestically and internationally since the original product line was introduced. The TenderGrill chicken sandwich, Burger King's current North American grilled chicken sandwich as of November 2013. Burger King and its Australian franchise Hungry Jack's have introduced a variety of grilled chicken sandwiches to its products portfolio since 1990. The BK Broiler was the first iteration, and was one of the most successful product introductions in the fast food industry to that point in time. However sales dropped in the following two years, and the product was reformulated and renamed to the Chicken Whopper to align the product with the company's Whopper Sandwich. A change of ownership of Burger King in 2004 prompted another reformulation of the product into the BK Baguette product line that focused on a more health-oriented product. This new formulation proved unpopular and was replaced in 2005 with the TenderGrill chicken sandwich. The TenderGrill sandwich was introduced as part of a series of sandwiches designed to expand Burger King's menu with both more sophisticated, adult oriented fare and present a larger, meatier product that appealed to 24-36 adult males. Burger King was the first major fast food chain to introduce a grilled chicken sandwich to the marketplace, beating rivals Wendy's by six months and McDonald's by four years. These two chains also went through a series of reformulations and naming schemes for their grilled chicken products. Burger King and its Australian franchise Hungry Jack's have had a variety of fish sandwiches in their product portfolio since 1975. The Whaler sandwich was the first iteration, designed to compete with rival burger-chain McDonald's Filet-O-Fish sandwich. With the addition of the company's Specialty Sandwich line in 1978, the sandwich was reformulated as the Long Fish sandwich. With the discontinuation of the Specialty Sandwich line, the sandwich was returned to its original recipe and name. With the introduction of the company's BK Broiler chicken sandwich in 1990, the fish sandwich became tied to the development cycle of the broiled chicken sandwich and was again reformulated and renamed as the Ocean Catch Fish fillet. When the broiled chicken sandwich underwent another reformulation in 2002, the fish sandwich was also redone and renamed as the BK Big Fish sandwich. By 2015, the sandwich had undergone several more modifications and went through a series of names including the BK Fish and Premium Alaskan fish sandwich. It is currently sold as the BK Big Fish sandwich in the United States and Canada. Internationally the fish sandwich is also known as the BK Fish, BK Fish'n Crisp burger and Fish Royale in those markets. An order of BK Chicken Fries. BK Chicken Fries are a fried chicken product sold by the international fast-food restaurant chain Burger King. At the time of their introduction in 2005, the company had intended Chicken Fries to be one of their larger, adult oriented products made with higher quality ingredients than their standard menu items. Additionally, the product further targeted the snacking and convenience food markets with a specific packaging design that was intended to be easier to handle and fit into automotive cup holders. The product was part of a series of product introductions designed to expand Burger King's menu with both more sophisticated fare and present a larger, meatier product that appealed to 24- to 36-year-old adult males. Along with this series of larger, more complex group of menu products, the company intended to attract a larger, more affluent adult audience who would be willing to spend more on the better quality products. They were discontinued in the United States in 2012, but continued to be sold in some markets, such as Italy. In August 2014, they were reintroduced for a limited time offering (LTO) in North America, leading to their permanent re-addition to the menu in March 2015 in over 30 countries globally. BK Chicken Tenders are a fried chicken product sold by the international fast-food restaurant chain Burger King. It is one of their snack oriented products designed for convenience of consumption. The turkey burger was introduced in 2013 as part of a spring-time limited time offering promotion called Festival of Burgers. The new sandwich was part of a series of new, updated or modified sandwiches and along with a revamped veggie burger, as a newer more healthier offering than its beef-based burgers. With the introduction of the sandwich, the chain became the largest restaurant chain to offer a turkey burger as part of its menu. Despite being declared a healthier option, the sandwich still weighed in at 10 oz (280 g) and 25% of a person's daily nutritional intake by the USDA standards. Despite its size, the sandwich was one of the chain's more healthful options, approximately 50 calories more than its TenderGrill chicken sandwich giving the chain three lower-calorie non-burger options. The new burger was part of a second wave of menu restructuring that included a stuffed bacon and cheddar burger, variations on the Whopper and a new coffee line that was co-branded with Seattle's Best Coffee. The chain also moved its advertising account from McGarryBowen to new agency of record Mother in February. The agency, who had already been working with the chain for several months as a secondary ad firm, introduced a new "people-centric" advertising program for the new sandwich line-up. The Chicken Burger was introduced in 2016 in the United States and Canada, and is Burger King's second foray into a non-beef hamburger in North America. The Chicken Jr. is a small fried chicken sandwich that consists of a chicken patty, lettuce and mayonnaise served on a sesame seed bun. It is one of the company's value oriented products. Originally introduced in the late 1990s as the Chick'n Crisp sandwich, the name was changed in 2013. The company has released several variants on the original sandwich. The sandwich was introduced in 1998 as part of a menu expansion that added a value menu which the company dubbed the Great Tastes Menu. Originally the sandwich was made with a 3 oz (85 g) chicken patty, mayonnaise, pickle on a sesame-seed roll. A parmigiana style sandwich with mozzarella cheese and marinara sauce called the Italian Crispy chicken sandwich was added later. The sandwich was eliminated in the US in 2000 but revived in 2007 as the Spicy Chick'n Crisp sandwich. In March 2012 the company reformulated the sandwich to the original patty and changed the spicy version to include a spicy mayo instead. The name was changed in 2013 to the Crispy Chicken Jr. and a new version called the Rodeo Crispy Chicken was added 2014. A 2007 advertising program for the spicy version of the Chick'n Crisp used the Whoppers, a "family" in which all the males are actors wearing a Whopper sandwich costume. In the ad spot, the parents come home and find that their son is having a party, when confronted the son blames his friend "Spicy." When the father confronts Spicy, he finds Spicy making out with the Whopper's daughter. Further ads in the program uses featured Whopper Jr. and Spicy antagonizing other fast food chains, proclaiming that Burger King has a superior value menu. A BK Veggie combo meal from Germany. The BK Veggie is a vegetarian soy-based meatless sandwich that is served at Burger King restaurants. The sandwich is not vegan, as it has dairy components, and is one of BK's health conscious oriented menu items. 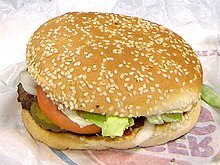 The BK Veggie is made with mayonnaise, lettuce, tomato, pickles, ketchup, and onions, and is served on a sesame-seed bun. The patty is supplied by Morningstar Farms. In Canada, the sandwich is prepared without mayo, while the patty is flame-broiled instead of being microwaved. The product was first introduced in 2002, shortly before the company's acquisition by TPG Capital, as part of a menu expansion that included a revamped King Supreme and other products designed to better compete with a similar planned menu expansion at McDonald's early the next year. It was originally prepared in the same manner as a Whopper, a flame-broiled veggie patty with lettuce, tomato, pickles, onion and ketchup served on a sesame-seed roll. However, unlike the Whopper, which features regular mayonnaise, a separate low-fat mayonnaise was utilized. Currently, the BK Veggie is prepared with regular mayonnaise. At the time the sandwich was vegan if the customer asked to have it cooked in a microwave oven, otherwise it was not considered vegan because it was cooked on the same equipment as the burgers and chicken. At the time of its introduction, the sandwich was hailed by many as a way to not only give vegetarians more options, but as a healthy alternative that gave all consumers more choices in meal options. The Center for Science in the Public Interest lauded the sandwich's low fat content, but derided the company's other menu items introduced at the time as being unhealthy. In 2005, CSPI observed, "too bad you can’t order it with less than 930 mg of sodium," which, while an increase from the 760 or 730 mg in the sandwich in 2002, was still less than the 1100 mg in the sandwich today [June 2010]. In UK outlets of Burger King, the BK Veggie was approved by the Vegetarian Society. Subsequently, on the menu boards, a 'Vege society approved' logo was shown next to the item name. The UK burger is also vegan when ordered without mayonnaise or cheese. In the US the sandwich was approved by PETA, who not only welcomed the BK Veggie as a way to give vegetarians more choice, but also hailed the company's recent agreement with the group to seek out suppliers that employ humane treatment methods in raising their animal stock. However, Burger King in the US publishes a disclaimer which states: "Burger King Corporation makes no claim that the BK Veggie Burger or any other of its products meets the requirements of a vegan or vegetarian diet. The patty is cooked in the microwave." The use of a corporate cross-promotion helped drive sales by giving the Morningstar Farms brand increased exposure and sales opportunities, while Burger King promotes an existing, trusted brand name which aids marketing efforts and encourages consumers to try the BK Veggie. The name BK Veggie is a registered trademark of Burger King Holdings and is displayed with the "circle-R" (®) symbol in the US and Canada. A spicy bean burger combo meal from the UK. The Spicy Bean burger is a fried sandwich sold by the international fast-food restaurant chain Burger King in parts of the European and Asian markets. It does not contain any meat but may be fried in the same oil as the fish products. The Spicy Bean Burger consists of a deep-fried, breaded bean-based patty, with ketchup, tomato, and American cheese on a 7-inch (20 cm) long sesame seed bun. A Mac n' Cheetos purchase featuring three out of five pieces. The Mac n' Cheetos is a deep-fried cheese-flavored, puffed cornmeal and macaroni and cheese product sold by the international fast food chain store Burger King. Mac n' Cheetos is the combination of both macaroni and cheese and the Frito Lay snack Cheetos. Mac n' Cheetos was first introduced June 27, 2016.
International fast-food restaurant chain Burger King and its Australian franchise Hungry Jack's have had a variety of breakfast sandwiches in their product portfolio since 1978. The Croissan'wich was the first major breakfast sandwich product introduced by the company. The company sells slightly different versions of breakfast sandwich between international markets, using local breakfast traditions and tastes to cater to those regions. To promote continuing interest in the company's breakfast products, Burger King occasionally releases limited-time (LTO) variants on its breakfast sandwiches that have different ingredients from standard sandwich recipes. Being one of the company's major offerings, breakfast sandwiches are sometimes the center of product advertising for the company. Additionally, as a major product in the company's portfolio, Burger King has registered many global trademarks to protect its investment in these products. Yumbo is a ham and cheese sandwich originally introduced by Burger King in 1968 and continued on the menu until 1974. In December 2014, it was announced that the sandwich would return to the menu for a limited time starting December 2 with 1970s themed advertising. The Yumbo is a hot ham and cheese made with Black Forest ham, American cheese, mayonnaise and lettuce on the sub roll used for the Original Chicken Sandwich. This differs from the original sandwich that was served on a hamburger roll with no toppings. In February 2016, Burger King introduced hot dogs in its American and Canadian markets. The hot dogs were marketed under the name "Grilled Dogs", were made from 100% beef and came in two varieties— Chili dogs and Classic. They were discontinued in 2017. The training videos for the product quickly became an Internet meme when it was revealed that they were hosted by Snoop Dogg and Charo. The videos were quickly leaked to YouTube, and received media attention. In the summer of 2010, Burger King took the unusual step of adding St. Louis-style pork ribs to its summer-time menu. The ribs, 3" long, bone-in ribs, sold for about $8 order and were extremely successful. The company were sold out of the ribs just over eight weeks into the ten-week run. The company began running out of its packaging halfway into the promotion. The company's new broiling units were one of the key pieces in the success of the product; the new flexible batch broilers were able to be cook the ribs in a relatively short period. The advertising campaign was produced by Crispin, Porter + Boguski and featured flying pigs convincing customers that a fast food restaurant could in fact produce good barbecue ribs at a reasonable price. The summer of 2012 saw the introduction of series of limited-time, summer-oriented products. Included in the new menu were a pulled pork sandwich and variations on its Whopper and TenderCrisp chicken sandwiches; each of these new products are based on regional barbecue styles from Tennessee, the Carolinas and Texas. Rounding out the products are an ice cream sundae topped with bacon, sweet potato fries, and frozen lemonade. The products are part of Burger King's ownership group plans to reverse sagging sales and diminished market share. Additionally, the new products were designed to ward off increased competition across the fast food burger restaurant industry from chains such as Five Guys and Smashburger. The Summertime BBQ menu returned in 2013, with the pulled pork sandwich, the Carolina BBQ sandwiches variants be continued. In place of the Texas BBQ sandwich variants and bacon sundae was a new BBQ rib sandwich and a series of desserts and milkshakes based on Oreo cookie products from Mondelēz International. On September 14, 2016, Burger King Cheetos Chicken Fries became available at participating restaurants. The Whopperito was a Burger King menu item that was introduced in 2016. It consists of most of the ingredients of the Whopper wrapped inside a tortilla. Instead of the ketchup, mayonnaise, or mustard, the Whopperito contains queso sauce. Burger King originally introduced it only at several of their Pennsylvania locations in June; on August 15, they began selling it nationwide. Leslie Patton of Bloomberg News speculated that the Whopperito represented an attempt by Burger King to compete with Chipotle Mexican Grill. British trademarks with the "EU" prefix are European Community wide trademarks. American, European, and New Zealand trademark offices do not allow direct linking of trademark information. ^ Shannon, Stevens (23 March 1998). "McDonald's woos franchisees with $25k store-update funding promise". Brandweek (subscription required). Archived from the original on 10 November 2013. Retrieved 2 October 2009. The MBX must deliver on value, which it does right now", said Ball, referring to the big beef, lettuce and tomato sandwich now in test, dubbed the latest "Whopper Stopper. ^ David Zuckerman (18 November 1985). "Burger giants launch new product assaults; McD speeds rollout of McDLT sandwich — McDonald's" (subscription required). Nation's Restaurant News. Archived from the original on 10 November 2013. Retrieved 23 October 2007. ^ Mannix, Margaret (28 April 1996). "A Big Whopper Stopper?". U.S. News and World Report. Retrieved 15 November 2013. ^ AP Newswire (2 July 1997). "McDonald's hoping new burger a Whopper stopper". The Augusta Chronicle. Archived from the original on 30 October 2007. Retrieved 23 October 2007. ^ Edwards, Cliff (1 July 1996). "McDonald's hoping new burger a Whopper Stopper". Associated Press. Retrieved 15 November 2013. ^ Díaz, Marian (20 February 2015). "Fallece creador del Whopper Jr.: Luis Arenas, quien presidió las operaciones de Burger King en Puerto Rico, murió esta semana". El Nuevo Dia. Guaynabo, Puerto Rico. Retrieved 20 February 2015. ^ Shimizu, Kaho (7 June 2007). "Burger King stages return under new management, realities". Japan Times. Retrieved 6 November 2013. ^ Chancey, Blair. "King, Meet the World". QSR Magazine. Retrieved 6 November 2013. ^ BKC Canada (5 April 2004). "Burger King Canada introduces a Whopper of a Canadian burger (Press release)" (PDF) (Press release). openface.ca. Archived from the original (PDF) on 5 February 2009. Retrieved 24 October 2007. ^ Rana, Preetika (30 October 2014). "Burger King Brings Beef-Free Whoppers to India". WSJ.com. Wall Street Journal. Retrieved 8 November 2014. ^ a b "Big in Japan: Burger King Sells Windows 7 Whopper". Fox News. 23 October 2009. Retrieved 3 November 2009. ^ "Burger King Gives Japan a Seven-Patty Challenge". TIME. 31 October 2009. Retrieved 3 November 2009. ^ Fletcher, Dan (1 April 2011). "The Left-Handed Whopper – 1998". Time Magazine. ^ Parekh, Rupal (14 April 2009). "BK to Revise Ad After Complaints From Mexican Official". AdAge. Retrieved 12 November 2013. ^ "Burger King 'Little Mexican' Ad Slammed in Spain". Fox News. Fox News. SkyNews. 14 April 2009. Retrieved 12 November 2013. ^ McDowell, Bill (10 February 1997). "Burger King Ads Take Slap at MCD: it's Double Supreme vs. Big Mac while Price Positioning Continues". Advertising Age. Crain Communications. Retrieved 23 February 2015. ^ a b c Zuber, Amy (17 December 2001). "Listen up, Mac: BK aims to reign supreme, orders menu changes". Nation's Restaurant News. Retrieved 4 December 2007. ^ Kramer, Louise (22 November 1997). "Burger King turns up flame on new products". Crain's Chicago Business. Retrieved 17 September 2015. ^ Warner, Melanie (28 July 2006). "U.S. Restaurant Chains Find There Is No Too Much". New York Times. Retrieved 3 December 2007. ^ Martin, Andrew (25 March 2007). "Will Diners Still Swallow This?". New York Times. Retrieved 3 December 2007. ^ Martin, Andrew (22 July 2007). "Did McDonald's Give In to Temptation?". New York Times. Retrieved 3 December 2007. ^ a b c d Snel, Alan (7 October 2011). "Burger King debuts new cheeseburger line". Nation's Restaurant News. Retrieved 16 October 2011. ^ Horovitz, Bruce (5 November 2013). "Burger King re-rolls out Big Mac-buster Big King". USAToday. Retrieved 5 November 2013. ^ Wong, Vanessa (7 November 2013). "Burger King's Big Mac Clone Becomes Even More of a Knockoff". Bloomberg Businessweek. Retrieved 25 May 2014. ^ "Burger King menu, italy" (PDF). Burger King Corporation. Archived from the original (PDF) on 29 October 2008. Retrieved 9 October 2007. ^ "Burger King menu, Spain". Burger King Corporation. Archived from the original on 28 September 2007. Retrieved 9 October 2007. ^ "Spain Nixes Burger King Ad". CBS News. AP Wire. 16 November 2006. Archived from the original on 12 October 2007. Retrieved 26 September 2007. ^ "Burger King Hatches Chicken Big King". Huffington Post. Burger Business. 16 April 2014. Retrieved 11 January 2016. ^ "REVIEW: Burger King Mushroom & Swiss Big King". The Impulsive Buy. 29 July 2014. Retrieved 8 March 2016. ^ "BK to launch 'Big King' burger". Advertising Age. 27 August 1997. Retrieved 16 January 2016. ^ a b c Warner, Melanie (28 July 2006). "U.S. Restaurant Chains Find There Is No Too Much". New York Times. Retrieved 3 December 2007. ^ Kelso, Alicia (8 March 2011). "Burger King Stackers added to Value Menu". QSR Web. Archived from the original on 14 March 2011. Retrieved 11 March 2011. ^ Northrup, Laura (11 March 2011). "Burger King's Stacker Deal Uses Questionable Math, Robs Customers Of Bacon". The Consumerist. Retrieved 8 October 2011. ^ ""Back by Popular Demand" Guides Burger Marketing". Burger Business. 10 October 2011. Retrieved 16 October 2011. ^ Morrison, Maureen (1 June 2011). "McGarryBowen Set to Grab Burger King Account". Ad Age. Ad Age. Retrieved 29 September 2011. ^ "BK Toppers Western BBQ – Burger King". Nation's Restaurant News. 7 October 2011. Retrieved 16 October 2011. ^ Morgan, Richard (14 July 1998). "'Soldiers' rating beef may be burger boost". Variety.com. Retrieved 28 August 2007. ^ a b "Review: Burger King – Rodeo Cheeseburger". Brand Eating. 25 November 2010. Retrieved 11 January 2016. ^ "BK Value Menu Launches in Burger King Restaurants Nationwide" (Press release). QSR Magazine. 28 February 2006. Retrieved 12 November 2008. ^ BKC publication (October 2007). "US Regional Menu Nutritional Brochure" (PDF). Burger King Holdings. Archived from the original (PDF) on 28 September 2007. Retrieved 27 October 2007. ^ "Burger King – New Rodeo Sandwiches and Value Menu Re-brand". Brand Eating. 31 December 2013. Retrieved 11 January 2016. ^ Hoffman, Ken (20 January 2014). "Drive-thru review: BK's Rodeo Burger a worthy addition to value menu". Colorado Springs Gazette. King Features Syndicate. Retrieved 11 January 2016. ^ Jensen, Jeff (6 July 1998). "Burger King bets big Small Soldiers push $25 mil promo banks movie box office hit". Advertising Age. Retrieved 11 January 2016. ^ a b Choi, Candice (18 March 2012). "Burger King to offer a turkey burger". Yahoo news. Retrieved 21 July 2014. ^ Rotelli, Wendy (25 April 2013). "(dead link)". Restaurants.com. Archived from the original on 27 April 2013. Retrieved 21 July 2014. ^ Peterson, Kim (18 March 2013). "Are we finally ready for turkey burgers?". MSN Money. Retrieved 21 July 2014. ^ Loria, Keith (March 2013). "The King's Evolution". QSR Magazine. Retrieved 21 July 2014. ^ Morrison, Maureen (26 April 2013). "Burger King Retools Marketing After First-Quarter Sales Slide". AdAge. Retrieved 21 July 2014. ^ "Burger King Goes Italian". QSR Magazine (Press release). Burger King Corporation. 22 March 2000. Retrieved 30 December 2011. ^ "BURGER KING® USA Nutritionals: Core, Regional and Limited Time Offerings" (PDF). Burger King. May 2013. ^ Center for Science in the Public Interest (May 2002). "BK breakthrough – Right Stuff". Nutrition Action Healthletter. Retrieved 4 December 2007. ^ Steven Mallas (17 May 2005). "Kellogg's Royal Partner". Motley Fool. Archived from the original on 17 December 2012. Retrieved 4 December 2007. ^ "Local Vegetarians to Party at Burger King". PETA. Retrieved 3 December 2007. ^ Miller, David (28 March 2007). "Burger King Offers Cage-Free Food". CBS News. Associate Press. Retrieved 21 August 2007. ^ "BURGER KING® USA Nutritionals: Core, Regional and Limited Time Offerings" (PDF). Burger King USA. July 2012. Archived from the original (PDF) on 6 August 2012. Retrieved 12 July 2012. ^ "Burger King Partners With Kellogg on Veggie Burger". Convenience Store News. 25 May 2005. Retrieved 4 December 2007. ^ Swerdloff, Alex (July 1, 2016). "America Loves Burger King's Mac N' Cheetos and We're All Doomed". Munchies. Vice. Retrieved July 15, 2016. ^ Lower, Claire (June 24, 2016). "My Standards for Stunt Food Are High: An Entirely Serious Review of Burger King's Mac 'n' Cheetos". xoJane. Time Inc. Retrieved July 15, 2016. ^ Lower, Claire (June 28, 2016). "My Standards for Stunt Food Are High: An Entirely Serious Review of Burger King's Mac 'n' Cheetos". Yahoo! Style. Yahoo!. Retrieved July 15, 2016. ^ Giammona, Craig (December 1, 2014). "Burger King Brings Back Yumbo Sandwich After 40-Year Hiatus". Bloomberg. Retrieved December 2, 2014. ^ a b Hume, Scott (December 2, 2014). "Burger King Is Bringing Back A 40-Year-Old Menu Item". Business Insider. Burger Business. Archived from the original on December 1, 2014. Retrieved December 2, 2014. ^ a b Ozersky, Jerry (6 July 2010). "Burger King on the Bone: A Rib Success Story". Time magazine. Retrieved 13 June 2012. ^ a b Ziobro, Paul (11 June 2010). "After 10 Million Ribs, Burger King Begins to Run Out". Wall Street Journal. Retrieved 13 June 2012. ^ Jennings, Lisa (12 June 2012). "Burger King launches barbecue-inspired summer menu". Nation's Restaurant News. Retrieved 13 June 2012. ^ "Ice Cream Whopper: Burger King Offering Bacon Sundae". CBS Connecticut. Associated Press. 12 June 2012. Retrieved 13 June 2012. ^ "Burger King Cheetos Chicken Fries coming soon". USA Today. 14 September 2016. Retrieved 23 September 2016. ^ Bort, Ryan (8 August 2016). "Burger King's New Whopperito Is as Disgusting as It Looks". Newsweek. ^ Kieler, Ashlee (8 August 2016). "This Is No Longer A Test: Burger King's "Whopperito" Going National Later This Month". Consumerist. ^ Patton, Leslie (8 August 2016). "Burger King Takes Aim at Chipotle Devotees With Whopper Burritos". Bloomberg. This page was last edited on 22 March 2019, at 01:09 (UTC).